The Palermo 5 Drawer Narrow Chest is an elegant and practical addition to any bedroom. 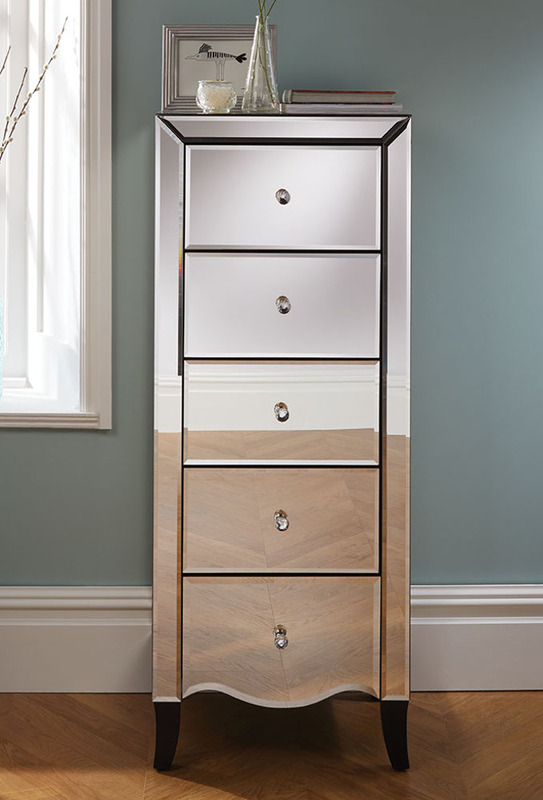 Add glamour instantly with the chest that offers 5 storage drawers and a focal point for the room. The entire frame of the Palermo 5 Drawer Narrow Chest has a mirrored finish, with classical bevelled edges and stunning mock crystal handles. The Palermo 5 Drawer Narrow Chest oozes romance and would work beautifully in a quality boutique hotel. Increase the amount of useable storage in your bedroom with the Palermo 5 Drawer Narrow Chest. The chest is perfectly sized for smaller bedrooms, or to use in addition to larger pieces of furniture. Introduce a touch of glamour to the corner of your bedroom or dressing room. The 5 narrow drawers of the chest are useful for storing smaller items such as make-up and beauty creams, even smaller pieces of clothing. The Palermo 5 Drawer Narrow Chest is a glamourous piece of furniture. The stunning design and fabulous finish of the piece is thanks to the quality craftmanship and materials used in the construction. The MDF frame provides the strength to the Palermo 5 Drawer Narrow Chest and is the perfect base for the bevelled edged mirror finish that is applied. The chest arrives at your home pre-assembled so you don't have to worry about nipping your fingers or papercuts! The Palermo 5 Drawer Narrow Chest is an elegant addition to any bedroom. 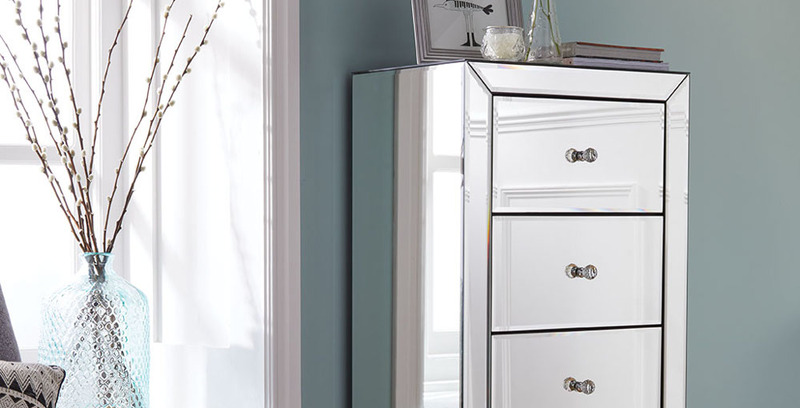 The beautiful chest is part of the high-class Palermo Mirrored Bedroom Furniture Collection. Create an elegant bedroom by mixing and matching your favourite pieces from the collection. Create the bedroom of your dreams by mixing and matching various pieces from the Palermo range. Each of the pieces of bedroom furniture in the range are designed to compliment each other and provide essential storage for your home.